My internet went out on Thurs morning and (to be perfectly honest) when I found out that we wouldn't have an appointment to get it back up until May 19th, I didn't make my card. But now that I've found that there are little spots of my house where I can connect wirelessly using Dustin's laptop, I've decided to make some cards. Here's my Caffinated Cropper card that I should have posted last Friday. 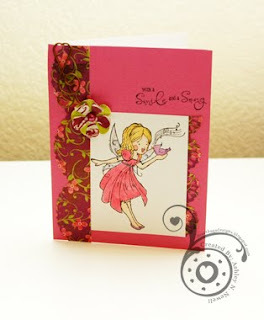 I used the Limelight sketch and product challenge for this card. All the elements are from the May Caffinated Cropper kit except the white card stock. I just used three punches and this card came together super fast. Don't forget to go over to Amy's blog and buy this awesome kit! This is adorable. I just love your take on this sketch. The things we do for the internet... LOL. This is beautiful! Love it!